There’s been a lot of news about taxing sugar-sweetened beverages as one way to improve people’s health and raise revenue that could be used for anti-obesity initiatives or other community programs. 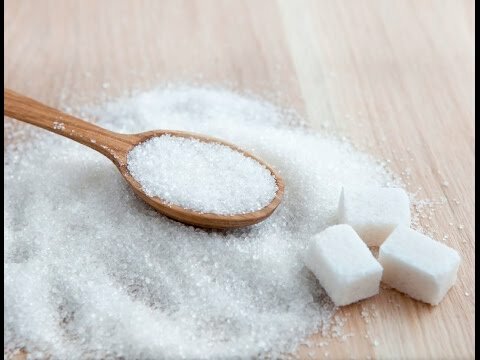 While controversial, many public health experts think this could be one way to encourage people to consume fewer sugary drinks and therefore help curb obesity in kids and adults. 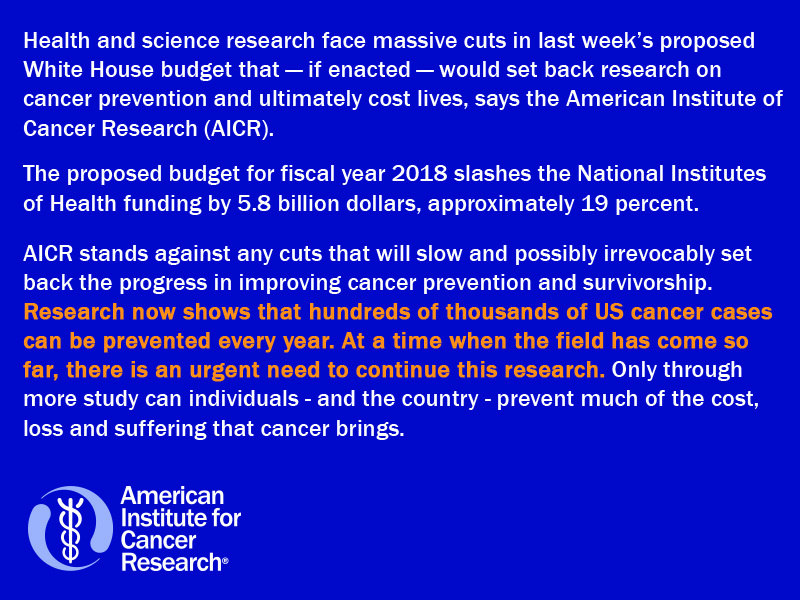 Health and science research face massive cuts in last week’s proposed White House budget that — if enacted — would set back research on cancer prevention and ultimately cost lives, says the American Institute for Cancer Research (AICR). The proposed budget for fiscal year 2018 slashes the National Institutes of Health funding by 5.8 billion dollars, approximately 19 percent. The National Cancer Institute (NCI) is part of the National Institutes of Health. While the proposed budget does not give details on what will be eliminated, AICR stands against any cuts that will slow and possibly irrevocably setback the progress in improving cancer prevention and survivorship. In 2017, there will be an estimated 1,688,780 new cancer cases. Over 600,920 people living in the United States will die from this disease. Research over the past few decades has led to a greater understanding of what drives cancer development and what protects us. Only through analyzing the global research has AICR’s network found many ways in which diet, weight management and physical activity lowers people’s cancer risk. Research now shows that hundreds of thousands of US cancer cases can be prevented every year. At a time when the field has come so far, there is an urgent need to continue this research. Only through more study can individuals – and the country – prevent much of the cost, loss and suffering that cancer brings. 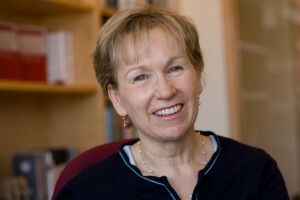 Much of the focus has been on Big Data, and on sharing science across institutions, in the effort to quickly move results from the lab to the public. In a nation where approximately four in ten people can expect to be diagnosed with invasive cancer in their lifetimes, we need big efforts to fight this disease. 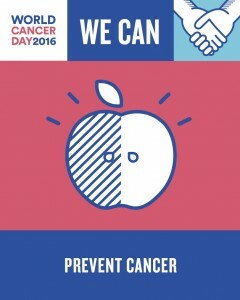 Today, World Cancer Day, is a time to raise awareness of prevention: Cancer prevention needs to be a part of the renewed push against cancer. Focusing only on the cure is like trying to douse a forest fire on one front while someone is lighting matches on another. The good news is that we already have the knowledge and tools here on earth to prevent a large proportion of cancers from developing, without reaching for the moon.